This volume deals with some of the multiple systems that growth factors and cytokines affect. The role of growth factors and cytokines on foetal development, in the immune and haemopoietic systems as well as in the skeletal and reproductive systems are covered. 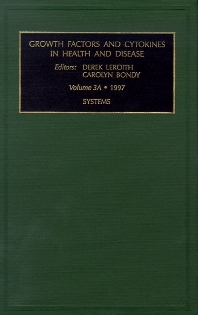 Various cancers are examined in a number of the chapters. This is the third and concluding volume of the treatise on growth factors and cytokines in health and disease. Contents. List of Contributors. Preface (D. LeRoith and C. Bondy). Growth Factors and Cytokines in the Fetus and Placenta (D.J. Hill and V.K.M. Han). The Immune System: A Functional Perspective (P.J. Morrissey). Growth Factors and Bone (A.M. Delany and E. Canalis). Hematopoiesis: Clinical Application of Colony Stimulating Factors (J.E. Janik and L.L. Miller). Insulin-Like Growth Factor Binding Proteins (D.R. Clemmons). Growth Factors and Cytokines in the Reproductive Tract of Women: Physiology and Pathophysiology (L.C. Giudice, Y.A. Chandrasekher, N.A. Cataldo, T. van Dessel, W. Saleh, O.W.S. Yap, and G.A. Ulaner).